"Report" can be a nebulous term that can mean many things to many people. But in the construction industry, reports need to contain fairly specific information that can be easily accessed and understood by readers from various backgrounds. Today as in many industries, it has become very common for these reports to be digitally generated. As this technology has improved over time, the advantages of digital transcription over traditional methods have become apparent. Documenting is more legible. File storage is more compact and there's little or no damage caused by fire or water. And it's now possible for appropriate parties to access these reports from multiple locations via multiple devices. All of that said, a digitally generated report still needs to contain the same information that a traditional "pen and paper" one does. These construction reports are important documents that chronicle work progress, provide employee information, and occasionally become court documents. In order to make sure that all information is included, it’s important to select the correct software for construction companies. And with the right software, what should be included in this paperwork to guarantee professional and accurate daily reporting? This covers everything from safety to supply, and software like Raken allows users not only to report and record these incidents, but track them with a search tool that allows this data to be retrieved with thousands of combinations of search words. Raken's software allows this data to be transferred to other reports as well. Aside from supply, nothing has a greater impact on job site work than weather. Raken's app allows site supervisors to check weather forecasts from various devices. This includes checking radar and receiving warnings. 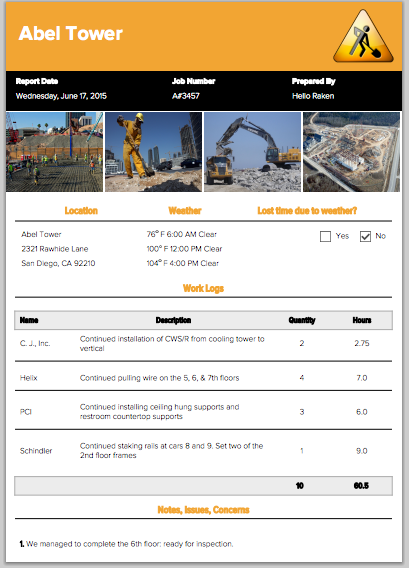 They can then issue reports to crews via devices, and can quickly update such reports in real time to include in a construction site daily report. Your firm's not really attached to those spreadsheets, are they? Reporting software like Raken's is like having an accountant in mobile devices. This software not only tracks billable and non-billable hours and generates reports, it can create records for analytical use, and track various project budgets. Your clients and stakeholders don't just want to hear that things are going well on a project. They want to be able to read this in a report, as well. Raken's software makes it easy for staff at all levels of a project to enter data, and easy to analyze it as well. And the more quickly data can be entered and read, the greater the improvement and productivity at job sites. Speaking of clients and stakeholders, it's often not possible for them to visit job sites. Raken's software allows for the insertion of digital photos that can track job progress. This feature is also convenient for adding photographs of site hazards and issues for daily reporting, and is easily updated.